Eating breakfast on a weekend was always a special treat, when I was growing up. You can take the time to sit and enjoy your meal, instead of running to catch the bus. 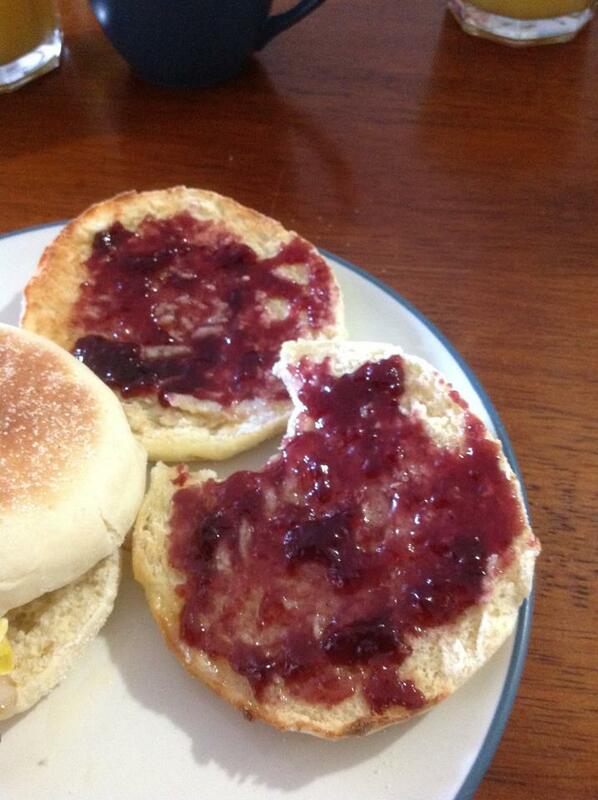 One of my fondest memories of growing up is the good old-fashioned bread with butter and jelly. I don’t recall too many times, when my family was having a nice breakfast, where we didn’t have toast with butter and jelly. Even when we visited our relatives in India, it was always there. Needless to say, after having a nice breakfast, it’s almost like a dessert for me to finish the meal with this buttery and sweet treat. If I really wanted to get things special, I would have an English muffin, instead of regular toast. 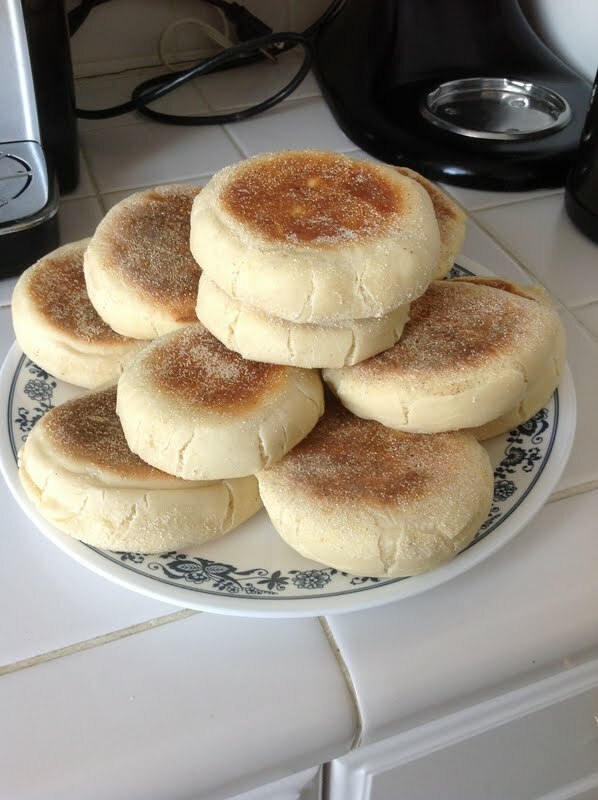 I have always loved English muffins but for some reason, I had not had one in a long while. I had recently purchased a package and to my dismay, I couldn’t enjoy it. You see, I have been making so many foods homemade, that I immediately noticed the plastic bag aftertaste and processed taste. 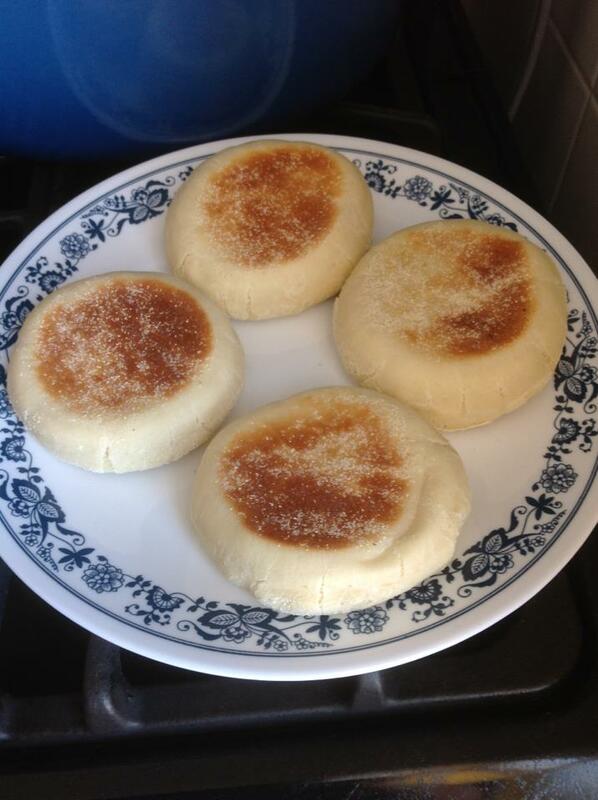 Well, today, I solved my issue and finally made my own English muffins. This recipe has been on my to-do list for about a year now and I finally had the opportunity to give it ago. 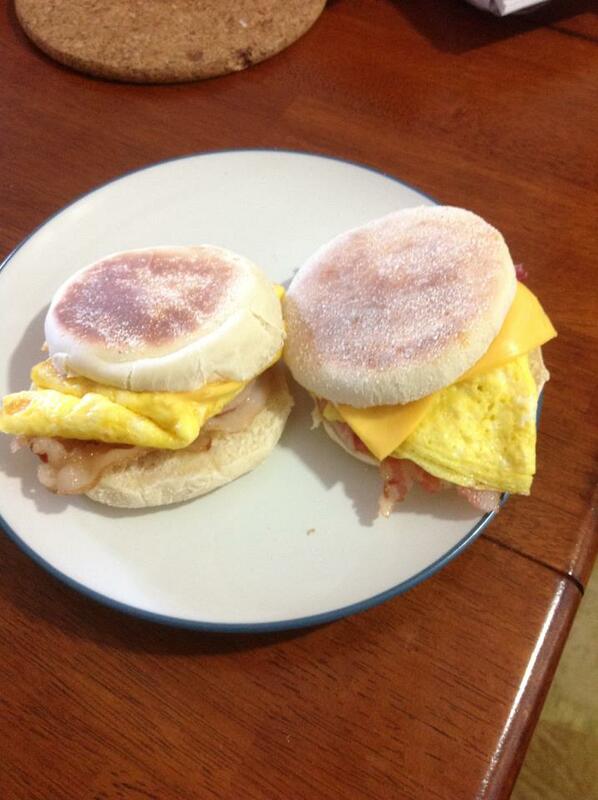 The results were great and the first 3 were immediately toasted and made into egg, bacon and cheese breakfast sandwiches for my husband and myself and the finally, the last became my long-awaited toasted, buttered and jellied muffin. That and a cup of coffee and I was in heaven. Hope you give it a try and enjoy it as much as I did. Add butter to milk and heat in microwave until milk is warm and butter has started to melt. Combine milk mixture, salt, sugar, egg, yeast together is stand mixer (or large bowl). Add about 4 cups of flour and mix until all the flour is incorporated. Keep adding flour until a moist dough is formed. I used about 3/4 cup more flour. 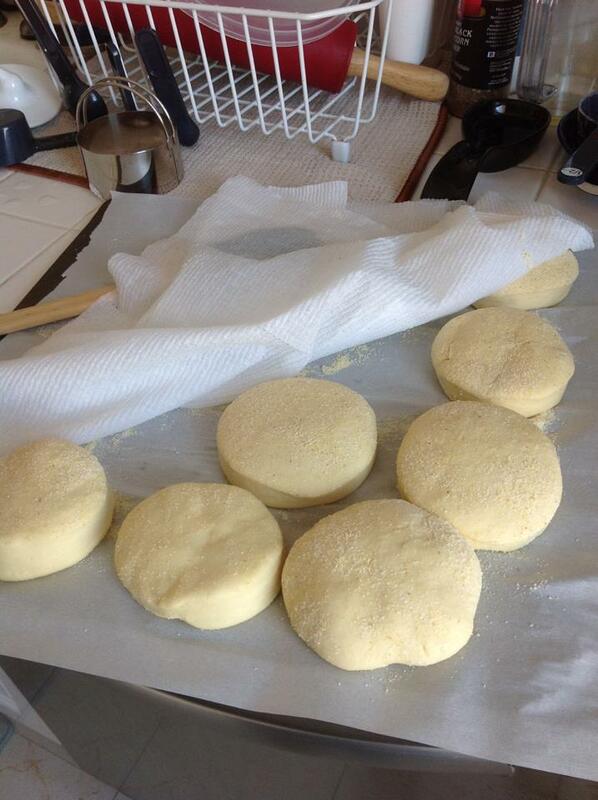 Place your dough on the cornmeal/cream of wheat and roll out 1/2 inch thick. Using a large round cutter (mine was about 3 inches in diameter), cut out circles and place on a cornmeal/cream of wheat surfaced tray. Keep re-rolling dough until all dough is used up. Cover the cut out dough with a moist towel and let it rise for 20 minutes. Heat a large griddle or frying pan to just under medium. 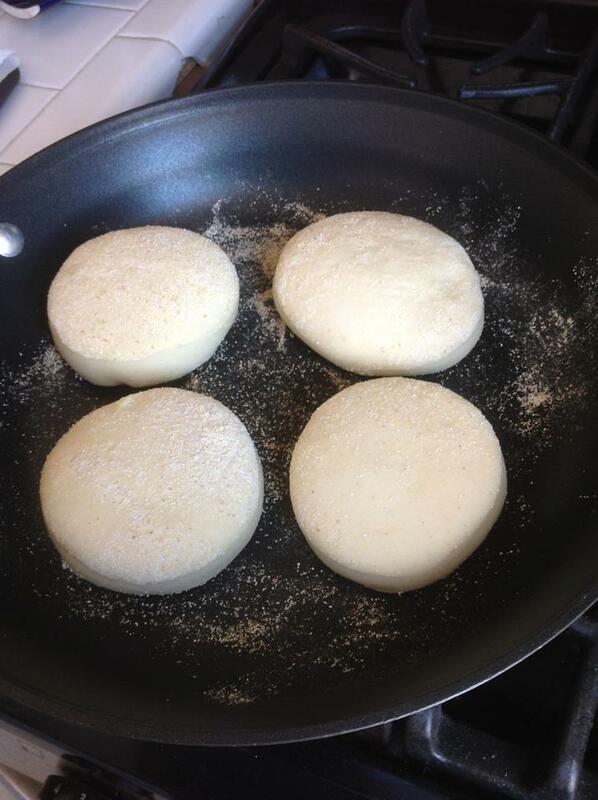 Scatter some cornmeal/cream of wheat on the surface of the griddle and place your muffins on the pan. Yum these look store bought and the recipe looks really easy too! Been on my to-do list for a long time too! These look perfect! I thought it would be difficult 🙂 It wasn’t too bad. It is very similar to making welsh cakes. Be warned, the cornmeal/cream of wheat can get messy 🙂 I hope you try it!! Happy Cooking!